Among the devotions that he cherished there were especially a tender love for the Immaculate Mother of God, a childlike affection for the Infant Jesus, and fervent devotion, also night adoration, of the Holy Eucharist. Once, while Saint Francis Anthony Fasani was absorbed in prayer, someone who happened to be in the church heard a voice saying: "This priest prays much for his people." Born in 1681 at Lucera, southeastern Italy, Saint Francis Anthony Fasani was the son of very poor peasants; but he was a bright lad, and received a good education from the Conventual Franciscans in his native town. 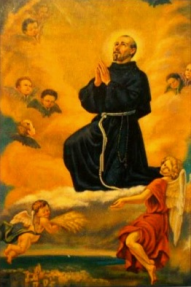 When Saint Francis Anthony Fasani was 14 he received the habit of St Francis among the Conventuals, and in 1705 he was ordained to the priesthood. He was then sent to the Sagro Convento, adjoining the basilica in Assisi where St Francis is buried, for the purpose of continuing his studies. Two years later he received the doctorate in theology, and he was then appointed lector of philosophy in the college conducted by the Conventuals in his home town. Saint Francis Anthony Fasani was promoted successively to regent of studies, guardian, and provincial, which latter office he held from 1721 to 1723. After that he served as master of novices, and then as pastor of the church of St Francis in Lucera. A bishopric was offered to him, but he declined it. From the process of beatification we learn that Francis Anthony was diligent in study, fervent in piety, prompt in his obedience to his superiors, devout in meditation, and most exact in the fulfillment of all his duties. He was also mortified and given to the exercises of penance even to bloodshed. From his youth he was an "angel in the flesh, more an angel than a man." As a priest, he also became an eloquent preacher, a lover of the poor, and a friend of the unfortunate. He was a missionary, a retreat-master, and a Lenten preacher. For hours he would sit in the confessional, hearing and absolving the sins of his penitents, consoling the afflicted, warning the hardened of heart. He spent much time in visiting the sick, the orphans, and the imprisoned. As a pastor he was a real father to his people. After 35 years in the priesthood and a life of penance, union with God, and intense labor the salvation of souls, God called Father Francis Anthony to Himself on November 29, 1742. On that day the people of Lucera came hurrying to the church of St Francis, exclaiming as did the children at the death of St Anthony of Padua, "The saint is dead! The saint is dead!" And for 200 years since then, they have continued to kneel and pray at his tomb. The cause of his beatification was introduced in Rome in 1832; and in 1951 Pope Pius XII solemnly enrolled Saint Francis Anthony Fasani among the blessed. from: The Franciscan Book Of Saints, ed. by Marion Habig, OFM.